Cook whole Kipflers in boiling salted water until just cooked through (10-15 mins). Cool slightly and slice into 1cm thick slices. Preheat oven to 200°C and place baking paper on a baking tray. Place cooked kipflers in the center of the baking paper. Add sliced zucchini and season with salt and pepper. 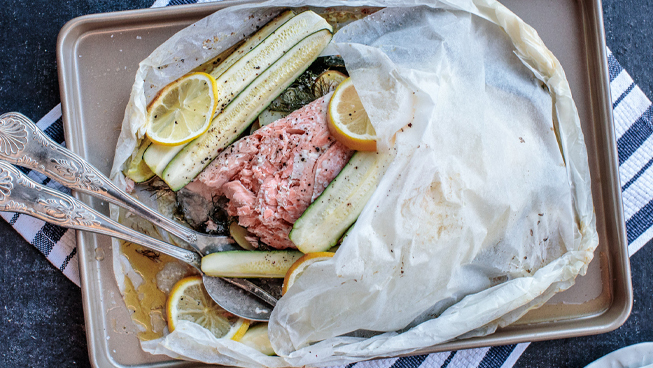 Place Tassal Salmon fillets skin down over the Zucchini, dollop cubes of butter on top and add a squeeze of lemon juice, season with salt and pepper then top with 2 slices of lemon and a couple of dill sprigs. Place second sheet of baking paper over the Tassal Salmon and seal the edges by making overlapping folds all around the edge. At the end, tuck the final crease under the pouch to secure the seal. Bake in the pre-heated oven for 25 mins. Remove from oven, let sit for 5 mins and then carefully cut open the baking paper to release steam. Garnish with additional fresh dill, serve immediately and enjoy!